Hi everyone, my name is Queen and I’m the new owner here at Dianna Agron Online! Some of you may recognize my name because I did fansites for a few years before I took a bit of a break but now I’m back. I’ve loved Dianna and this site for a very long time so I’m very happy that I get the opportunity to work on it and add to its already amazing content. I already did a bit of updating to the site in the projects sidebar and uploaded today’s candids which I will be making a post about in a bit. Take a look around and let me know if you see things that need to be fixed because while I’m making my way around the site slowly to fix things, there may be some things that will slip past my attention as the site is quite large and extensive. Thank you so much and I look forward to bringing you more great content on our lovely Dianna! I’m happy to inform you that Dianna Agron Online has now a new home, which means you can now browse our site and content. The only different thing is our domain – you can find us at d-agron.org so make sure to update your bookmark! I would like to thank the two people who helped me buy the new domain – Summer and Hayley. Thank you so, so much. I don’t think I’ll ever be able to thank you enough. Speaking of the site, I’m currently updating the gallery, so check us out again in the next days! You may have already noticed that we have a new layout here at Dianna Agron Online, both here on the site and on the gallery as well, thanks to Kimberly. I really like this new layout, mostly because it features a beautiful and relaxed Dianna at her own place, sharing a dinner with her closest friends, including Glee stars Jenna Ushkowitz and Becca Tobin. Let us know your opinion on the layout and if you want to check the photoshoot, just click the image below! Hi, guys! 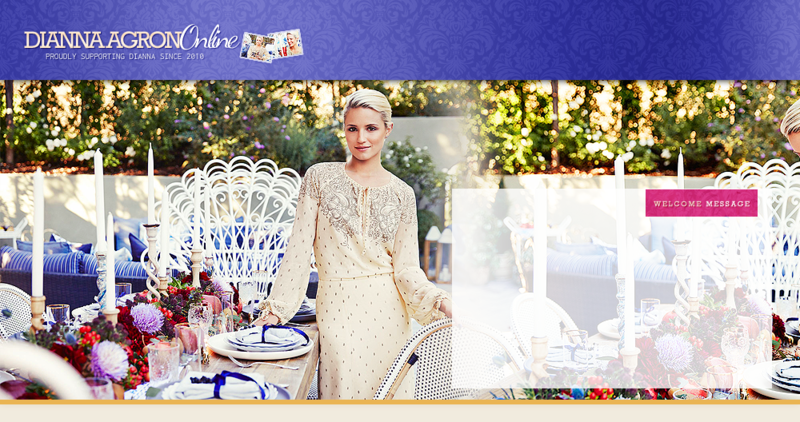 My name is Fran and I’m the new owner of Dianna Agron Online! This site has been my number 1 site when it came to Dianna so being the new owner is a honor, other than a pleasure. Stay tuned for a big gallery update with all the missing pictures of events, photoshoots, screen captures and more as well as news, especially of Dianna’s newest project – McQueen! And don’t forget to follow us on Twitter, if you aren’t already. I’ve added over 50 HQ photos of Dianna on the set of Glee on September 22! I’ve added 33 HQ photos of Dianna shopping in West Hollywood with a friend on September 19! I’ve added two sets of recent candids to the gallery in HQ! We have new themes up at both the gallery and the main site here thanks to Ray! Hope everyone enjoys the new looks. Stay tuned, updates will be coming within the next few days. Hello everyone, I’m Holly and I will be running Adoring Dianna Agron from now on. Don’t worry though, Renee will still be a part of the site and stepping in every now and then to help out! I’ve uploaded some images of Dianna from the set of her new movie Tumbledown to the gallery, please stay tuned for more images which I will be adding slowly!